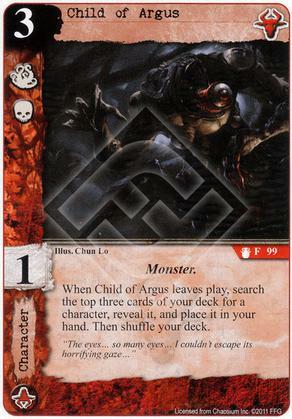 Action: Pay 1 to put Master of the Myths into play from your hand. 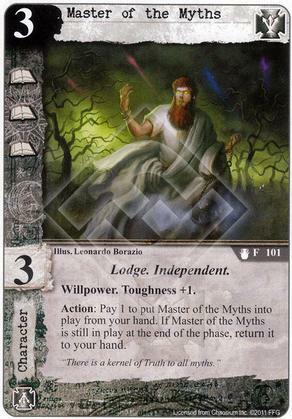 If Master of the Myths is still in play at the end of the phase, return it to your hand. "There is a kernel of Truth to all myths." 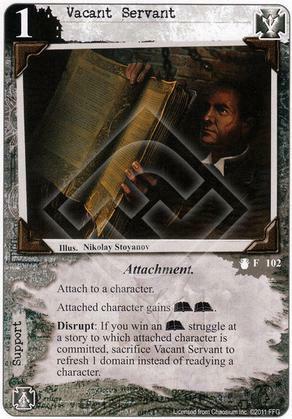 Attach to a non-Ancient One character. Take control of attached character. 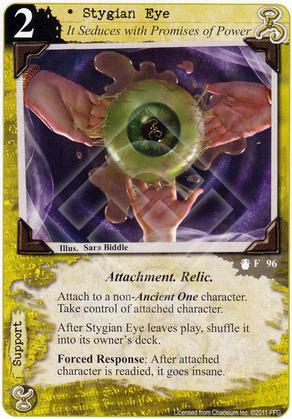 After Stygian Eye leaves play, shuffle it into its owner's deck. Forced Response: After attached character is readied, it goes insane. 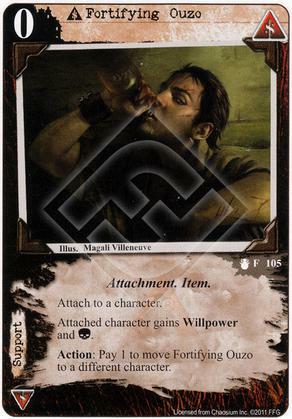 Attach to an opponent's support card. 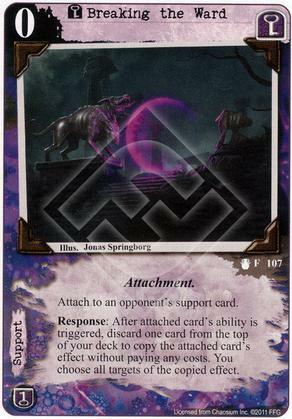 Response: After attached card's ability is triggered, discard one card from the top of your deck to copy the attached card's effect without paying any costs. You choose all targets of the copied effect. Action: Choose a domain. 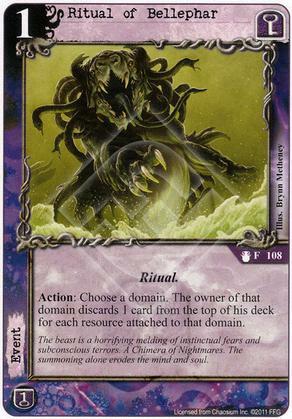 The owner of that domain discards 1 card from the top of his deck for each resource attached to that domain. The beast is a horrifying melding of instinctual fears and subconscious terrors. A Chimera of Nightmares. 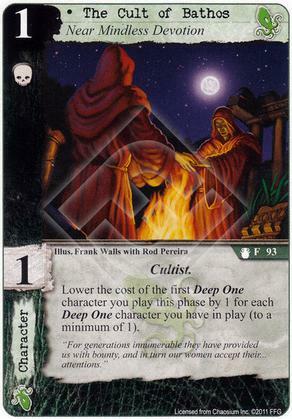 The summoning alone erodes the mind and soul. 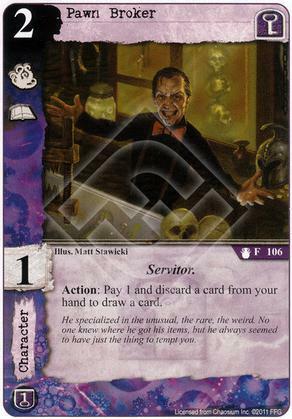 Action: Pay 1 and discard a card from your hand to draw a card. He specialized in the unusual, the rare, the weird. No one knew where he got his items, but he always seemed to have just the thing to tempt you. 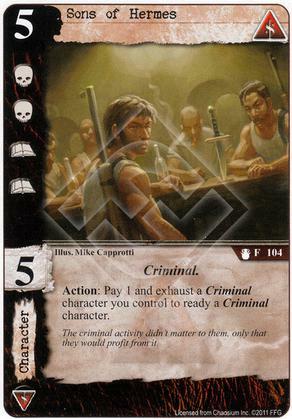 Action: Pay 1 and exhaust a Criminal character you control to ready a Criminal character. The criminal activity didn't matter to them, only that they would profit from it. Response: After you succeed at a story without losing any struggles, return a character you control to your hand. 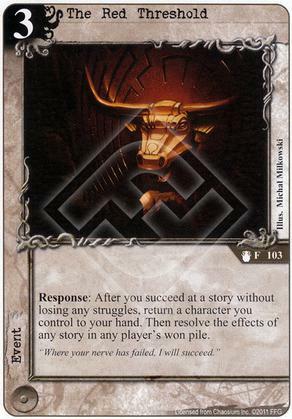 Then resolve the effects of any story in any player's won pile. "Where your nerve has failed, I will succeed." Disrupt: If you win an (A) struggle at a story to which attached character is committed, sacrifice Vacant Servant to refresh 1 domain instead of readying a character. "The eyes... so many eyes... I couldn't escape its horrifying gaze..."
Attached character gains the Mi-Go subtype. 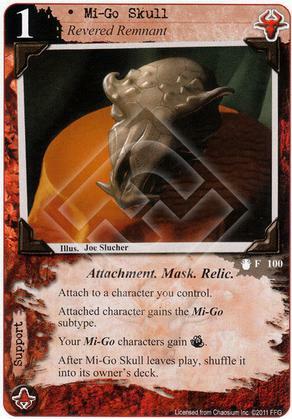 After Mi-Go Skull leaves play, shuffle it into its owner's deck. Attached character gains Willpower and Invulnerability. 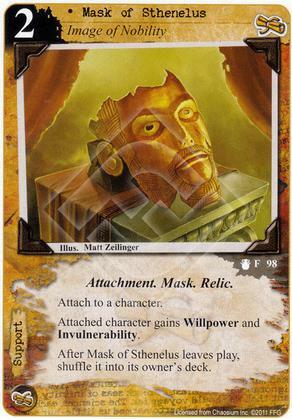 After Mask of Sthenelus leaves play, shuffle it into its owner's deck. 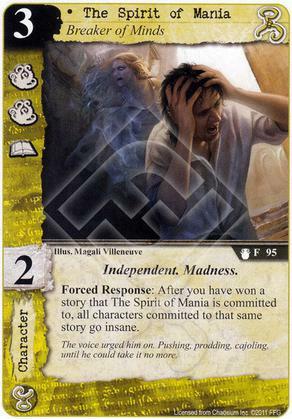 Forced Response: After you have won a story that The Spirit of Mania is committed to, all characters committed to that same story go insane. The voice urged him on. Pushing, prodding, cajoling, until he could take it no more. "We do all the work and they get all the credit." 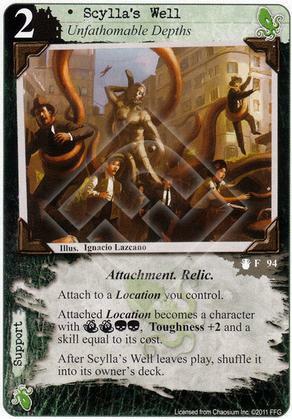 Attached Location becomes a character with (T)(T)(C)(C), Toughness +2 and a skill equal to its cost. 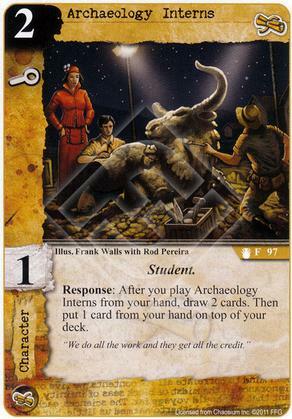 After Scylla's Well leaves play, shuffle it into its owner's deck. "For generations innumerable they have provided us with bounty, and in turn our women accept their... attentions." 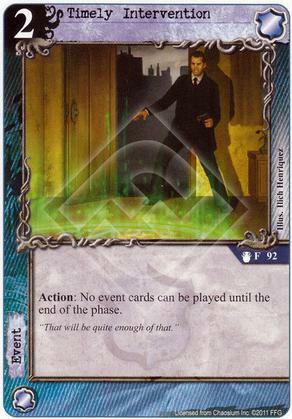 Action: No event cards can be played until the end of the phase. "That will be quite enough of that." 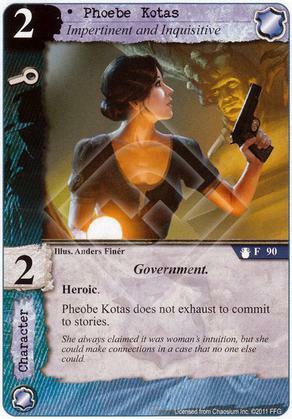 Pheobe Kotas does not exhaust to commit to stories. She always claimed it was woman's intuition, but she could make connections in a case that no one else could. Response: After a character is destroyed, ready Alexander Pallas. 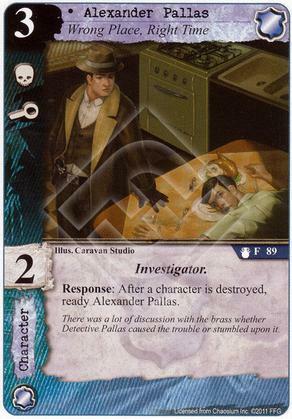 There was a lot of discussion with the brass whether Detective Pallas caused the trouble or stumbled upon it. 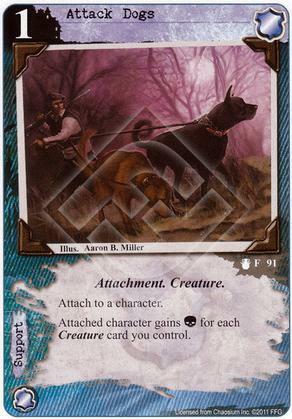 Attached character gains [Combat] for each Creature card you control.